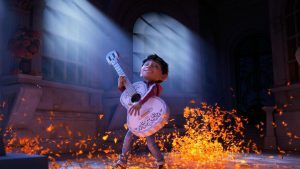 Coco follows Miguel (Anthony Gonzales), who wants to become a musician despite his family’s ban on music. He accidentally ends up in the Land of the Dead on Dia de Los Muertos, where he meets a shifty con artist named Hector (Gael Garcia Bernal). He must break his family’s curse on music and get back to the real world before he gets stuck in the Land of the Dead. Coco is a truly touching movie, with fleshed-out characters, amazing music, an emotional, personal plot, and gorgeous animation. The characters in Coco are stellar. It’s super fun and interesting to watch Miguel’s (physical and inner) journey across the Land of Dead where he definitely grows as a character. Anthony Gonzales is really great as Miguel, and he gives a ton of emotion in his vocal performance. Hector is another solid character. We learn a lot about him over the course of the movie, and although he seems one-note at the beginning, he has a ton of depth to him. As far as the animation goes, this movie contains the best animation I’ve seen all year. It’s standard for Pixar to make their movies look gorgeous, but this movie is really special. Everything about both the Land of the Dead, the real world, and the characters all look amazing. Some of the shots of streets and buildings are super realistic and it’s hard to believe it’s animation at times. The entire design of the Land of the Dead is also great. The city’s design is colorful, creative, and we get to see a ton of it through Miguel’s trip through the city. Speaking of which, this movie is insanely colorful. There are a ton of bright, neon colors found inside the Land of the Dead that work the almost real animation to make something that looks awesome. 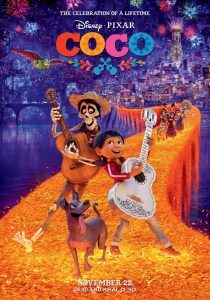 Both the score and the original songs in Coco are great. There are some very catchy, and sometimes even genuinely emotional original songs in the film that are used in just the right places. The vocals from the cast are very good and they can all sing exceptionally. The plot of Coco is never cliched or cheesy and there are lots of really surprising twists and turns. It has a lot of depth, which is expected from a Pixar film, and is captivating to watch. From the very beginning, you see Miguel’s world and how he has to deal with it. It keeps you constantly engaged as he goes farther and farther away from his home and learns more about his family. There’s also no shortage of humor here: the movie mixes emotion with some good jokes very well. Pixar knows how to make their audience cry, and their strategy is very effective here. The movie deals with a very personal, human story, even for Pixar, and it has a giant emotional payoff near the end. The reason this works is because the movie develops these characters and you learn so much about them. By the time that the emotional punch rolls around, you’re deeply invested in these characters and you care about them a ton. At the center of this movie is a story about family. It explores the different aspects of a family, their flaws, and their traditions, as Miguel learns more and more about his family and their history. It also dives into what it means to be remembered, and all of these themes are displayed in the fantastic story that a bunch for both adults and kids. 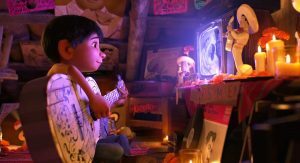 Coco is very informative about Mexican culture and Dia de Los Muertos, and you can learn a lot about that holiday through this movie. Honestly, there’s nothing much wrong with this movie. I can’t think of anything to complain about and it was just a beautiful movie in all senses of the word. Coco is one of the best films of the year. It mixes colorful, realistic animation with emotion, a deep plot, and great music to make a really original, sweet movie. I would recommend it to all ages and there’s something in it for everyone. I really enjoyed all the colors and songs. As usual, Pixar created a touching story. I really liked your review, I agree. But you didn’t mention the songs and the music in Coco. I thought that your review was very accurate. You basically took everything I wanted to say about it, yet made it better. Roy and I watched it together, and there is no doubt that it is a exemplary movie for all ages to be enticed. Some say that the plot was really translucent, but it seems like we agree that it was intense and dazzling.